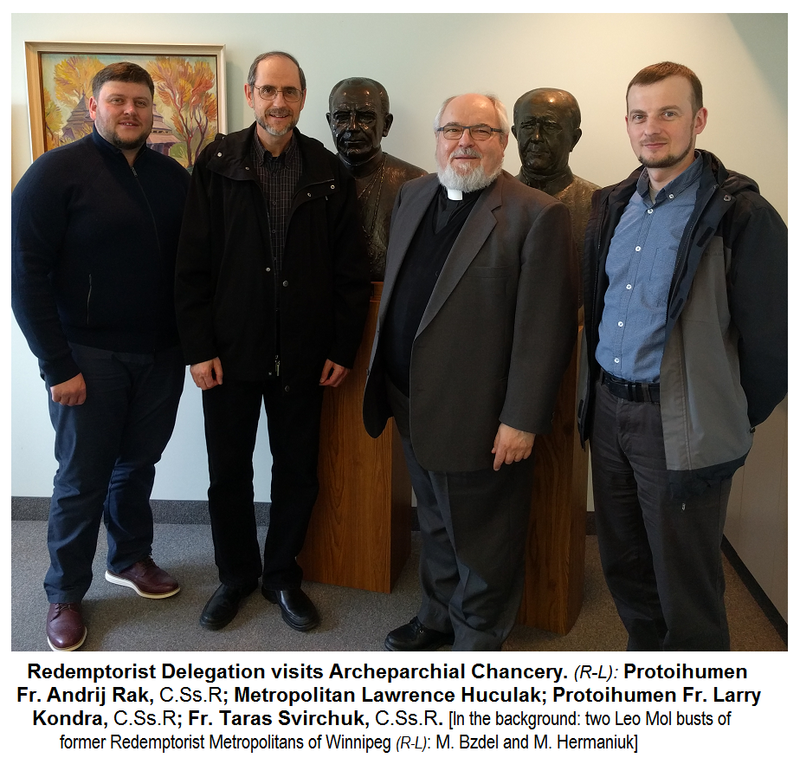 The ‘Protoihumen’ or Provincial Superior of the Redemptorist Fathers in Ukraine paid a visit to Metropolitan Lawrence Huculak at the Chancery of the Ukrainian Catholic Archeparchy of Winnipeg. Father Andrij Rak, CSsR was elected to head the congregation in November of 2014. It was the Provincial Superior of the Redemptorist Fathers in Canada, Father Larry Kondra, CSsR who brought his counterpart for the courtesy visit and they were accompanied by the Pastor of the St. John the Baptist Ukrainian Catholic Parish in Newark, New Jersey – Fr. Taras Svirchuk, CSsR. In the conversation that took place place in both Ukrainian and ocassionally English (which the Ukrainian Provncial spoke well), Fr. Rak shared about the activities of the Redemptorists in Ukraine. A number of the Fathers are involved with military chaplaincy as the war continues to devestate the eastern and southern regions of the country. They also are involved in releif work with the over 1.5 million internal refugees. The Redemptorist Fathers have parishes, monasteries and houses in a number of regions in Ukraine. He spoke of one of their monasteries in the city of Berdyansk on the coast of the Sea of Azov that is very near the “ATO” war zone. It serves as a sort of base for pastoral activity for those involved with chaplaincy ministry. The Redeptorists that visited the Metropolitan are shortly leaving for a visit to the monasteries and parishes of their religious congregation in Saskatechewan – where the Bishop, Most Rev. Bryan Bayda, is also a member of the Redemptorists.